There you have it—the title logo for the upcoming comic book series by myself, and Desirée Lee. “Confluence” is going to be unlike anything you’ve ever read before. It will be a unique blend of science fiction and fantasy. It’s a series where anything can—and just might!—happen. “Confluence” will be published bi-monthly by Umbral Press. At the moment, Desirée Lee and I are reading the 2-volume set of the RPG based on Jim Butcher’s New York Times bestselling series “The Dresden Files”. The RPG volumes are titled “Volume 1: Your Story”, and “Volume 2: Our World”. Both of us are fans of the series. Both of us are interested in RPGs. That’s why we’re reading these books. However, we’ve discovered another excellent reason for reading these—they are an outstanding resource for writers in general. These books share a wealth of information on setting up plots, and twists in a story. Even if you aren’t a fan of Mr. Butcher’s work—if that’s the case, what is wrong with you, I must ask!—and/or have no interest at all in RPGs, I still highly recommend reading these books. Again, they’re a great resource for writers in general in the form of plotting tutorials. 1) The books are out of print. It was a chore for Desirée and I to track down copies. 2) If you haven’t read “The Dresden Files”, but plan to, do so before reading these RPG books. At least as far as “Small Favor”, which was the current novel in “The Dresden Files” series at the time of these RPG books’ release. There are a lot of spoilers for the novels in these RPG volumes. Desirée Lee and I are looking for an artist or art team for an on-going, bi-monthly, fantasy comic book series. 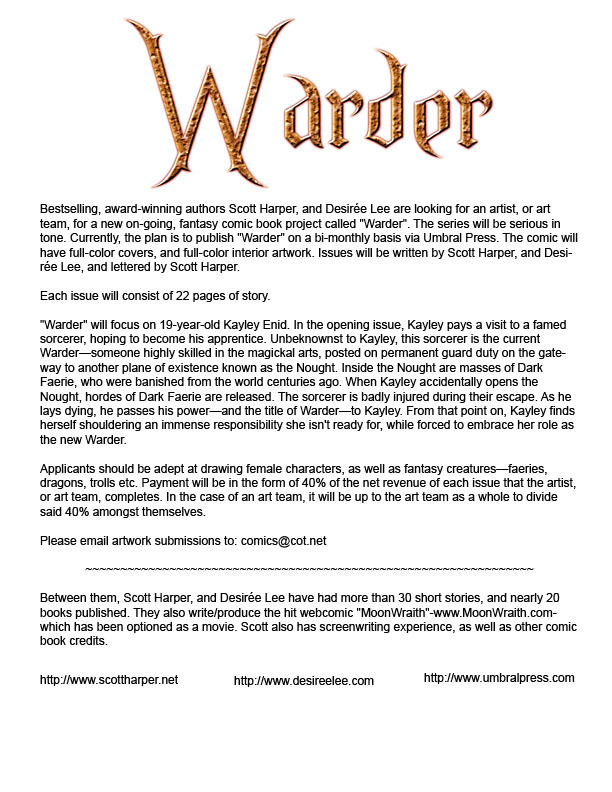 The project is titled “Warder”. Please see the ad below for details other information. I just turned in a batch of material for a new interview. This interview will focus on comic book projects that Desirée Lee and I are currently involved with. The main focus of this interview will be “MoonWraith”—www.MoonWraith.com—and our upcoming new series, “Confluence”. “MoonWraith” has been running for 70 weeks. During that time, we have seen over 40,000 hits. This past summer, “MoonWraith” was also optioned as a movie. Desirée and I want to thank everyone for your support of this project. Issue #4 just began this week. Keep reading, please, because there is a whole lot more to come!